I was tagged by Angela Pea! 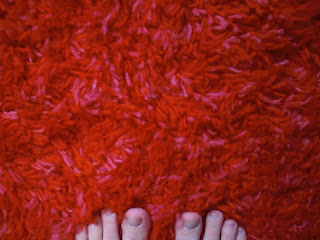 * Post photos of 7 red things in your home. * Tag 7 people to do the same. 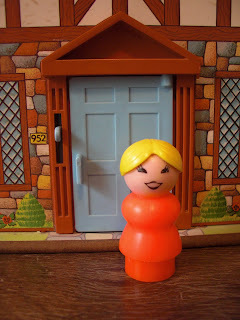 Me, in vintage Fisher Price Little People form. 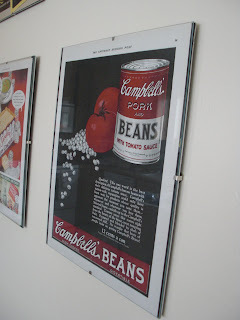 A framed vintage magazine ad on my kitchen wall. I love that they advertise their beans as "digestible!" My red (and pink) scrap bin. It's much less full since I've been working on my epic I-Spy project -- but obviously still bulging! Teeny-tiny hot cocoa. This is endlessly special to my son! 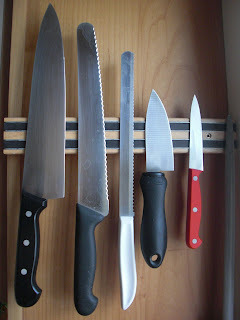 My red paring knife! It was a Valentine's gift from my husband a couple years ago. It's a very nice knife -- and my favorite, of course! 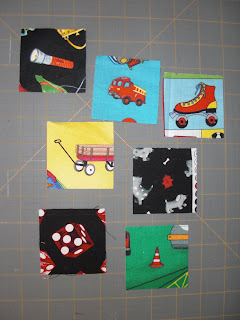 And, by request from Angela Pea, seven little red I-Spies -- soon to be sewn into my quilt! Bethany, Heidi, Jen, Wendy, Cammie, Shannan, and Michelle! What fun! Thanks for including me. 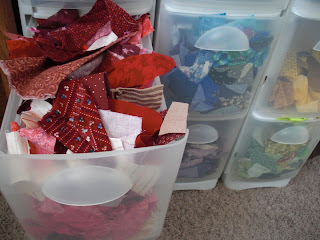 :) Your fabric scrap organization is fantastic! I think I'm going to have to head to the store and find something like that for my scraps. Great idea! Love that Red shag, can't wait to hear the story about it! Wow!! 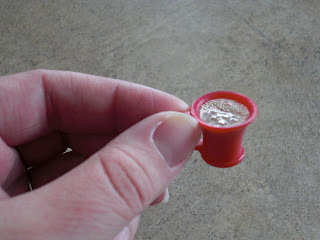 I adore the mini-mug, and my oh my, the red shag is Fantablous! Thanks a ton for the I Spy pics! Care, you are so sweet to think of me. I am so boring. I don't have much red in my house at all. Please don't be mad that I am not doing this! OK! If you are anything like Mr. Joel or Ms. Laurel, you are more than amazing!! !